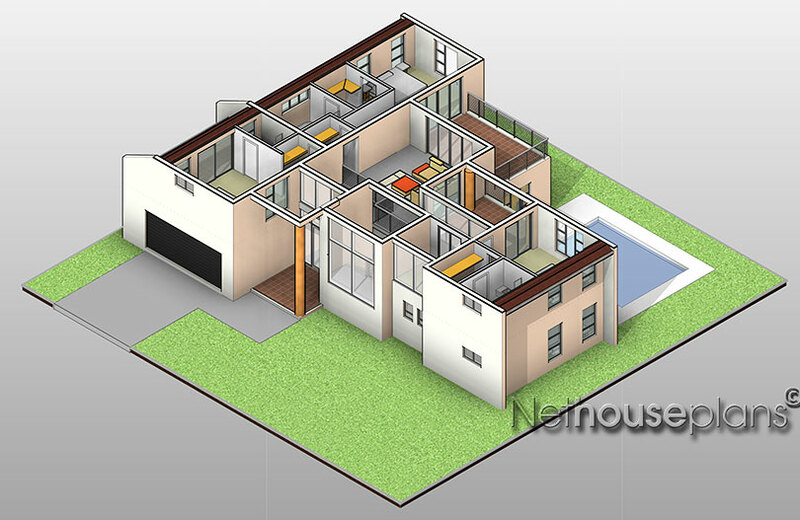 Ground Floor: Double garages, entry hall, entry porch, kitchen, kitchen island, scullery, dining, guest wash closet, living room, staff room, guest bedroom (en-suite with walk in closet), patio – An interesting traditional house plan of note! First Floor: 3x Bedrooms (All en-suite, Master bedroom with walk in closet), shared bathroom, pyjama lounge, double volumes, balconies, linen cupboard, study area. 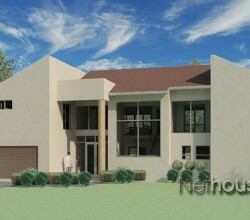 Nethouseplans presents this interesting home design for a medium size family. A Traditional style architectural design that features on the ground floor an open plan living room that flows through to the dining area and kitchen with scullery. 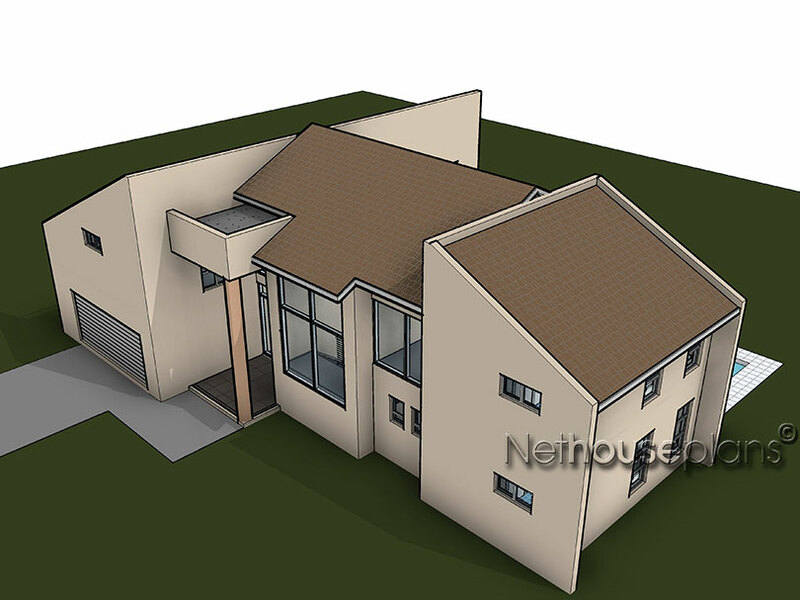 An en-suite guest bedroom with its own walk in closet is also fitted in this design with access to the patio. A staff room with bathroom is designed outside the house. The first floor features a study room that can also used as an office, two well appointed en-suite bedrooms, a family den and an en-suite master bedroom with its own walk in closet. The family den and all the bedrooms have access to a balcony. 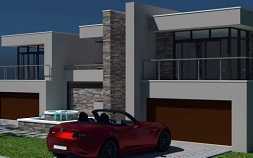 An integrated double garage completes this 407m2 home design. 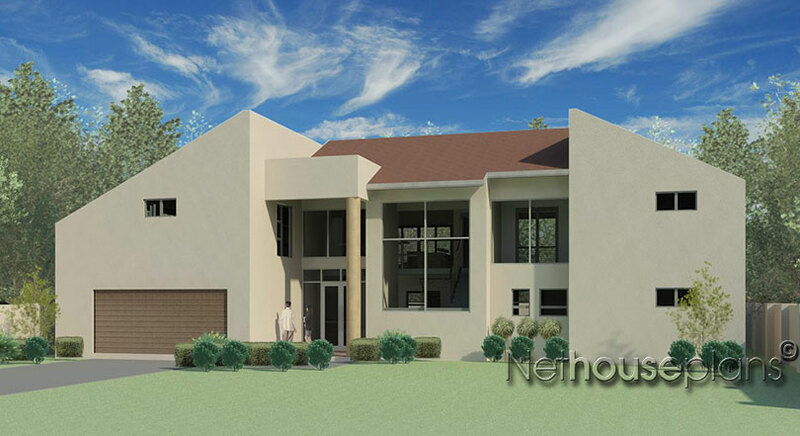 This home design is perfect for the owner that wants to have a great entertaining space while maintaining seclusion and privacy for the family. 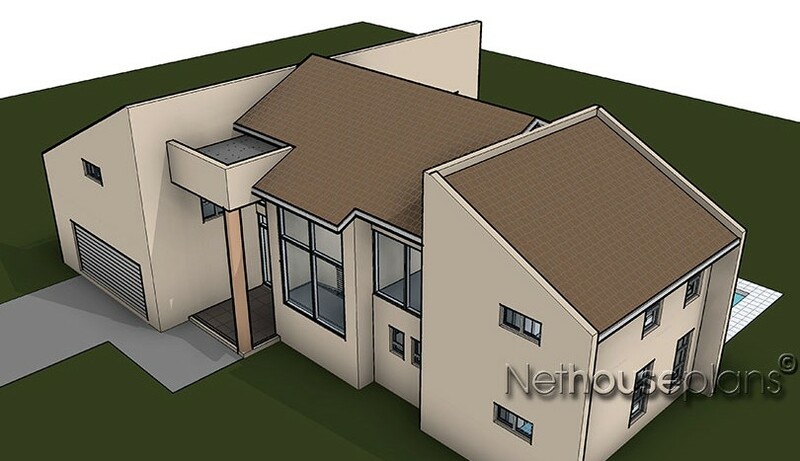 Openness and flexibility are the main themes of this massive 407m2 house plan. The ground floor welcomes any guest with a two car garage and large entry hall. To the left of the entrance lays the kitchen with a large island, scullery, and staff quarters. Centrally located is the dining area and living room that provide the perfect area for entertainment. Towards the right lays an entire guest bedroom wing that is equipped with a large walk in closet and en-suite. Both the dining area and guest bedroom have access to the patio which further leads the pool. 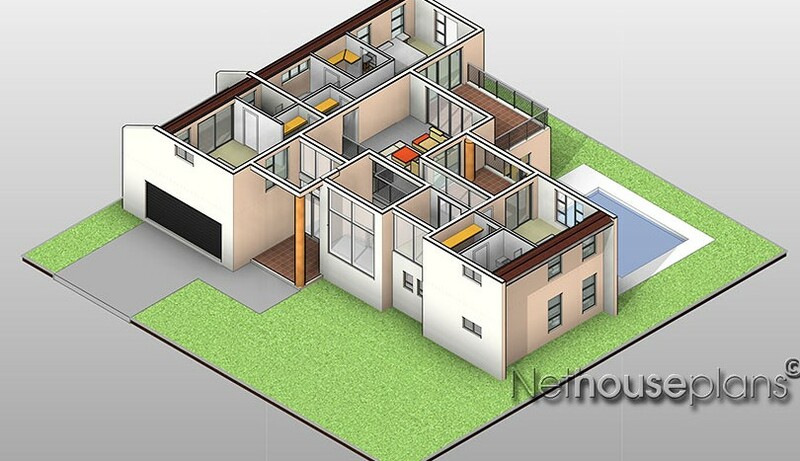 The first floor of this houseplan demonstrates a well-planned living area for the residents. Centrally located on the first floor is a spacious family den with access to 2 of the 3 balconies. A single spare bedroom comes with an en-suite and its own private balcony. Close but still far enough for privacy; the master suite is equipped with both a walk in closet and en-suite. On the other side of the first floor lays a study and additional bedroom with walk in closet and en-suite. 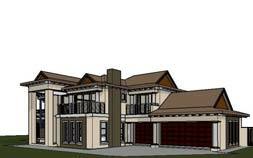 This house plan is perfect for any potential owner and provides the best combination of comfort and luxury living. 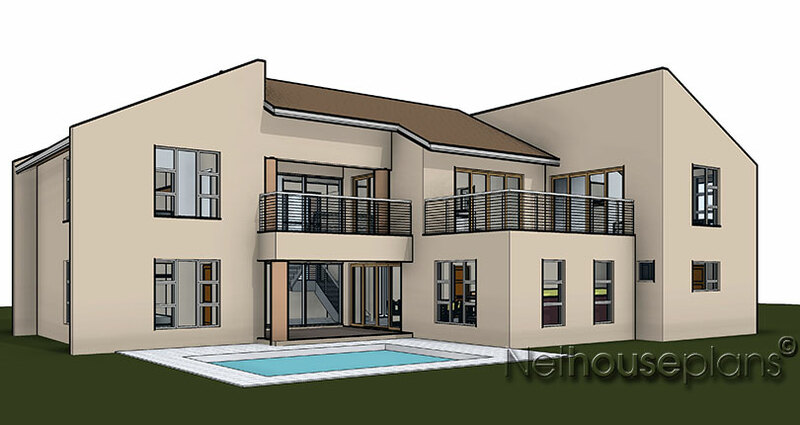 Nethouseplans is committed to delivering a high level of expertise and attention to detail in the design, sales and customer services to our clients. ©2015 Nethouseplans. All Rights Reserved.